I have very few of these Hoosier style glassware. They have always been expensive to collect. This is the drippings jar for the cabinet. I do have this glass lid taped down. This piece is in minty shape. And I am attempting to keep from having the lid move around freely. Which leads to flea bites on the rims. Here is a wonderful vintage image of a Hoosier cabinet. And that interesting brown dot there... is actually a felt dot. Just helping keep that lid from sliding around. 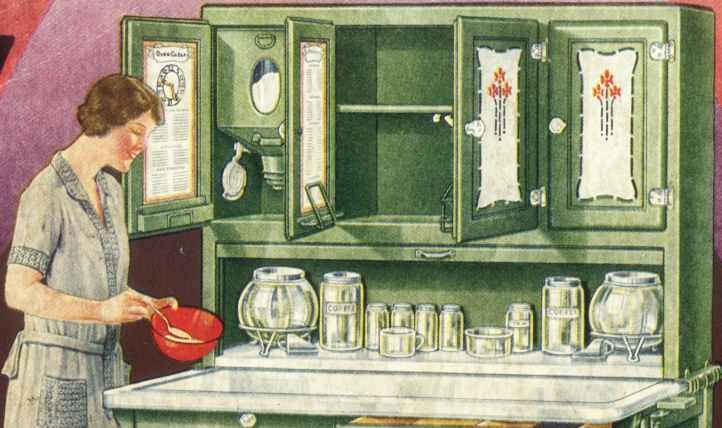 I would love to own a actual Hoosier cabinet... but I doubt I would ever get all the glassware together to finish it. Love the retro picture - the glass looks great grouped together. Great collection. I do have that drippings jar to go with my shakers and spice jars. I use to find them at a good price. Not any longer! I love the syrup pitchers. I have always wanted one but never have bought one. Finding the jars and such for a Hoosier cabinet isn't all that hard.I bought a cabinet cheap that just had some of the shelves and in about a year or two, I found the jars, salt dish, spice jars, cutting board and even sugar bin. I already had the flour bin/sifter. By the time I was done, I had only spent 455.00 on it, including the cabinet. Keep your eyes open. You can find a bargin! I have shakers, canisters and this drippings jar in the standard depression glass green. Then I have shakers and canisters in the dark forest green. And somewhere I have one of the cookie jars that was made of the clear glass. But they were all purchase as random finds, that were not priced outrageously. I have not had much luck finding them in the last couple of years... unless they had a ridiculous price tag. But I love the glass that belonged to these Hoosier style cabinets. And I keep looking a the cabinets when I come across them. I am partial to the ones that are painted. Versus the really pricey pretty ones that are oak. I inherited my grandmother's cabinet. It is the two top door, one long door (flour sifter) and roll top for the sugar bin. I just love it. I have the glass canisters but I had not seen a drippings jar. Thanks for posting about such an interesting piece of historical furniture.